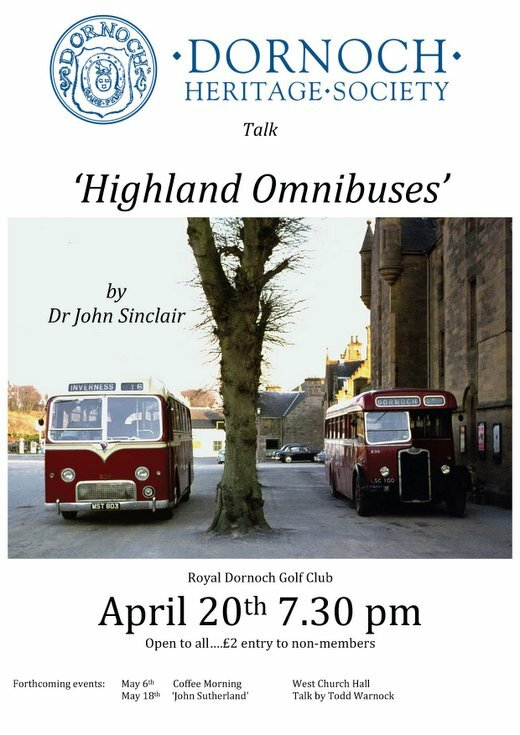 Audio recording of a talk on Highland Omnibuses operations in the North and West of Scotland given by Dr John Sinclair to the Dornoch Heritage Society on 20th April 2017. Dr Sinclair focused mainly on the 1960s and 70s, concentrating on the Dornoch / Tain /Lairg/ Helmsdale area. His interesting talk was illustrated by an amazing collection of colour images. For more than 50 years, the retired surgeon has travelled across the Highlands taking pictures of local buses. In doing so he clocked up an estimated 100,000 miles of bus journeys along the way. Dr Sinclair has also captured some beautiful images of the area's mountain landscapes. The retired surgeon from Milngavie, East Dunbartonshire, said, 'It’s all about nostalgia. It’s not just about buses. It’s about the rural scenery and the signs of the times. The majority of my pictures were not taken at bus stations or stances, but all over the Highlands in rural sightings. I just did it for fun. I love travelling around and talking to people." Dr Sinclair practised medicine in Stornoway and other towns across the north of Scotland before becoming a surgeon based in Glasgow. His obsession with buses began with his seventeen mile journey to and from school every day and, in 1961, he bought his first 35mm camera which took colour slides. He estimates that in his lifetime he has taken over a quarter of a million pictures. Dr Sinclair was introduced and thanked by Peter Wild of the Dornoch Heritage Society.